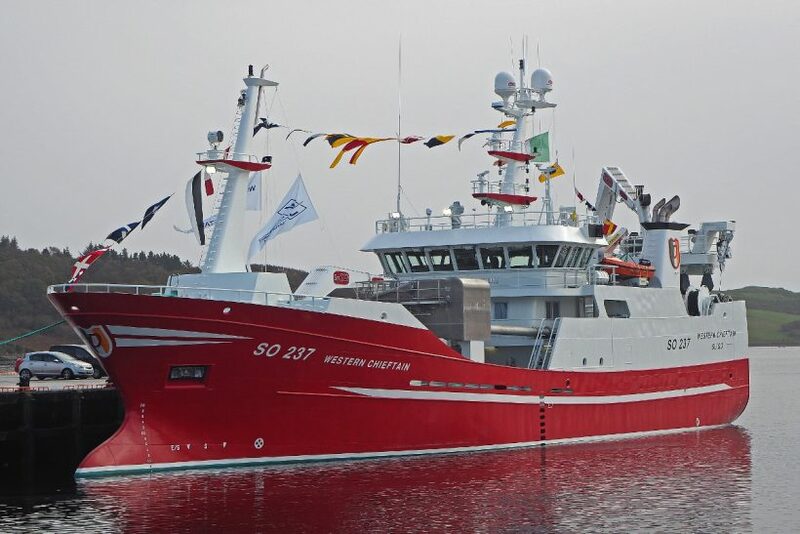 Within 48 hours of Western Chieftain being blessed at Killybegs, the vessel sailed on her maiden trip to fish mackerel east of Orkney, after rendezvousing with the crew’s long-standing pair-trawl partner boat Girl Stephanie G 190, which had been sheltering in Lerwick after having work carried out at Skagen. Dressed overall for the blessing service at Killybegs. 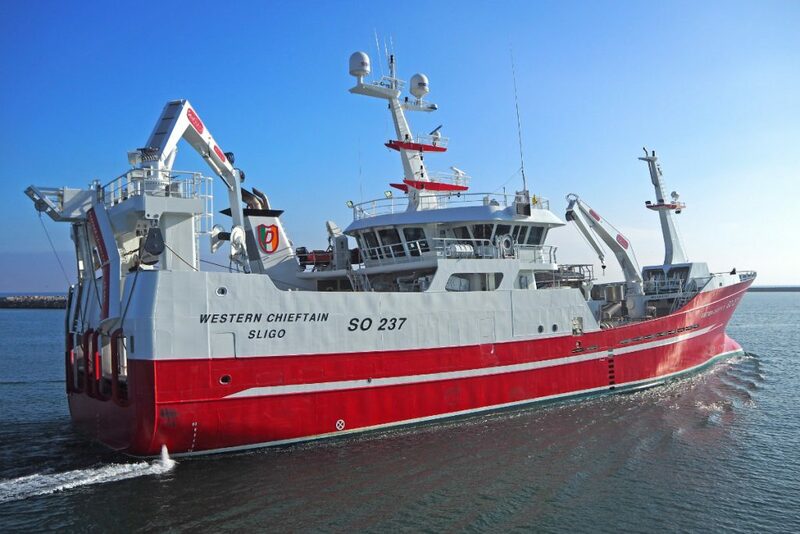 Western Chieftain, together with her onboard systems, is reported to have performed well on the first trip when pairing with Girl Stephanie and using a SNG midwater trawl. 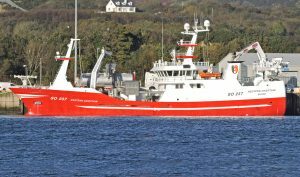 This was fished in scruffy weather, similar to that the vessel encountered the previous week, on the delivery passage from Skagen to Killybegs via Kincasslagh, Co Donegal, home of owner Frank Doherty of Premier Trawlers, and his brother and skipper, Charlie Doherty. 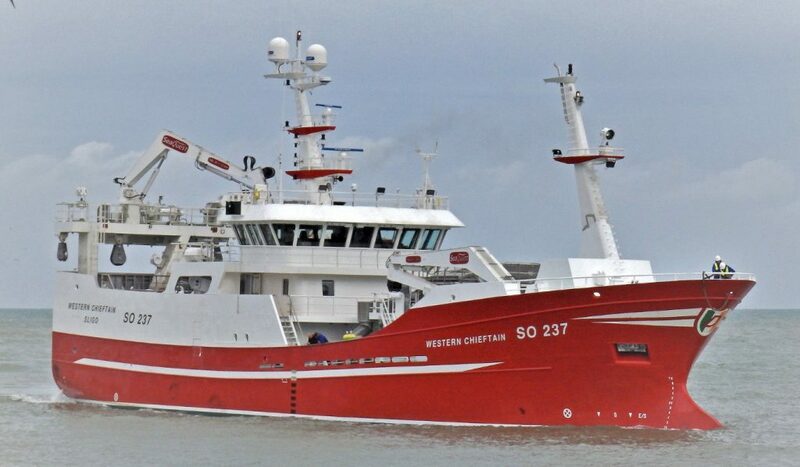 That Western Chieftain hit the ground running is not surprising given that, apart from recent developments in engine/propulsion technology and hull design, the vessel is broadly similar to the 45m midwater trawler of the same name that Karstensens delivered in 2004. That boat replaced Sean Pol D 641, which was extensively refurbished by Karstensens in 2001. 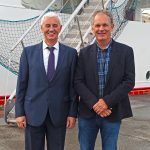 The association between Kincasslagh and Skagen is further strengthened by the fact that Karstensens also built three boats, all named Western Viking, for Frank Doherty in 1997, 2005 and 2015. 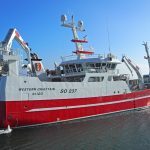 The most significant difference between the new Western Chieftain and her 14-year-old predecessor is that catches of pelagic fish are pumped aboard over the stern, rather than forward of amidships on the starboard side. Stern pumping has rapidly become the accepted norm on new pelagic boats in recent years, as it enables a vessel to continue to dodge up into the weather while the lifter section of the brailler is attached to the fish pump, without the need for the boat to come round on the gear, and take the weather on the broad. 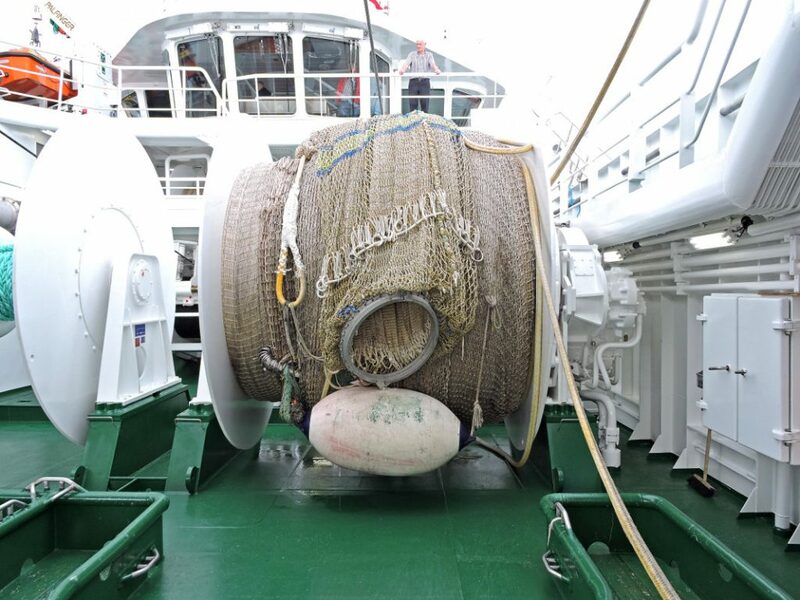 This ensures that hauling and pumping is a continuous process, from the doors coming up to taking the bag back aboard. General view of trawling arrangements at the stern of Western Chieftain. 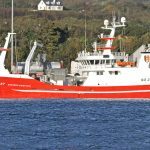 Sailing with a crew of eight, skipper Charlie Doherty expects to follow a similar pattern of pair-trawling with Girl Stephanie, for a combination of mackerel and horse mackerel on a seasonal basis, that proved successful with the previous Western Chieftain. 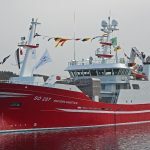 A new 51.9m Girl Stephanie G 190, for Pauric, Tómas, Theresa and Stephanie Conneelly of Galway, is now being fitted out by Karstensens at Skagen. 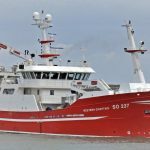 She will pair up with her sistership Western Chieftain on completion early next year. 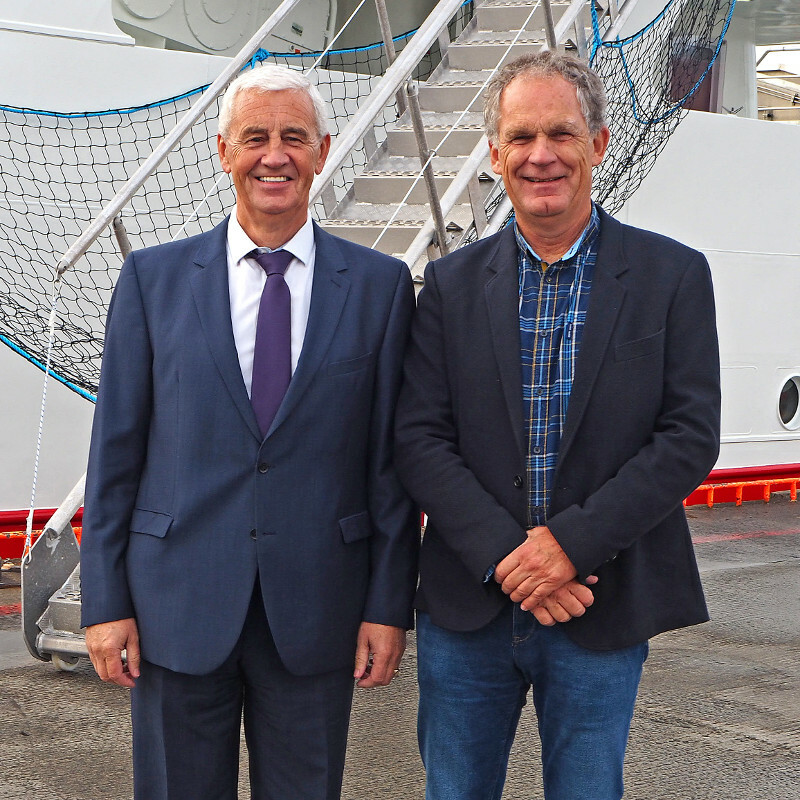 Delivery of the new Western Chieftain further enhances Karstensens’ strong association with Ireland, where half of the pelagic fleet in Killybegs – Áine SO 734, Brendelen SO 709, Father McKee SO 708, Girl Stephanie G 190, Neptune SO 715, Paula D 165 and Western Viking SO 718 – were built at Karstensens Shipyard, as was the Castletownbere-owned Menhaden S 135. Designed in-house by Karstensens Shipyard, Western Chieftain has an registered length of 45.80m, 11.20m beam, and a depth to shelterdeck of 7.25m. From the outset, particular attention was given to the midwater trawler’s underwater hull form, in order to achieve optimum levels of freeboard, stability, free-running speed and towing capability across the full spectrum of load state, with minimal hull resistance and fuel consumption. 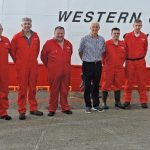 Western Chieftain’s crew, from left to right: Paul Hegarty, Christopher Doherty, Niall Doherty, Seamus Curran, Michael Wincup, Charlie Doherty (skipper), Gareth Murphy (mate), Joe Doherty and Dermot McNeilis. 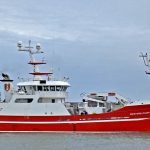 Of round bilge hull form, Western Chieftain’s hull was built to DNV-GL +1A1 Fishing Vessel class at Nauta Shipyard, Gdansk, Poland, before being towed to Skagen in mid-June, where fitting-out was completed in only four and a half months, in time for the early winter mackerel fishery. Hempel coatings were applied after Western Chieftain had been completely sandblasted and hot zinc-sprayed. In addition to the continuous main and shelter decks, Western Chieftain features long forecastle and boat decks. Anchor and mooring winches are arranged in a dedicated winch house on the forecastle, forward of a roll-reduction tank. 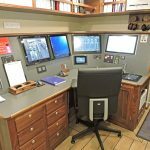 The customary full-width deck casing is situated at shelterdeck level, and is accessed from either aft on the port side, above the wet deck-gear changing room, or on the vessel’s centreline into the main accommodation passageway. 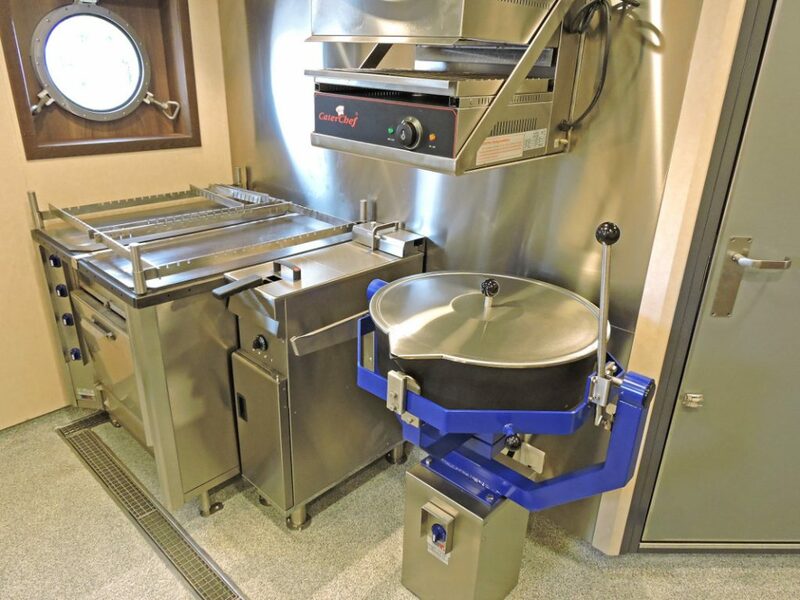 The central mess-room is flanked to starboard by a stainless steel galley, together with a walk-in dry provisions store/freezer room, and a full-length lounge on the portside. Main forward and island wheelhouse consoles. 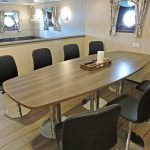 Finished to the high levels of comfort and practicality that are customary on pelagic vessels, which can operate continually for several weeks at a time during peaks of seasonal activity, the accommodation areas on Western Chieftain are arranged over three levels. 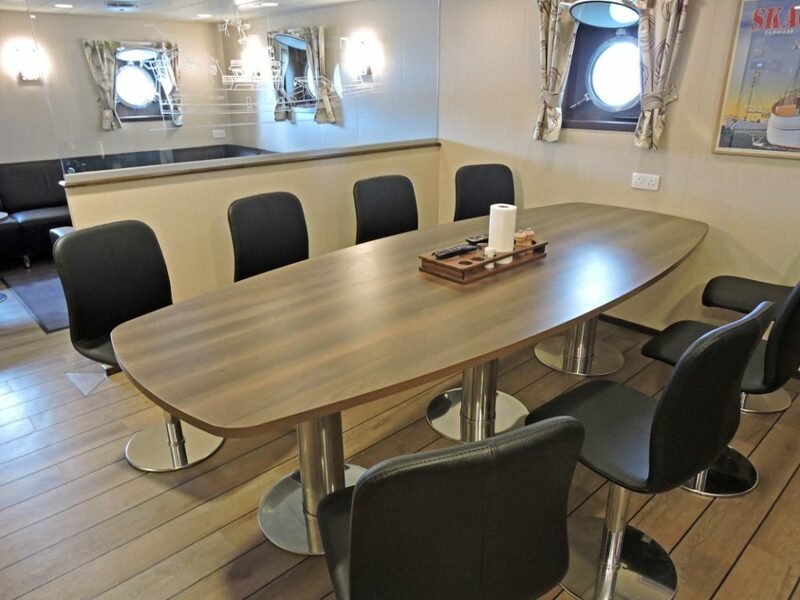 Single-berth skipper and mate en suite cabins, together with adjoining lounges, are arranged at boat deck level underneath the wheelhouse. 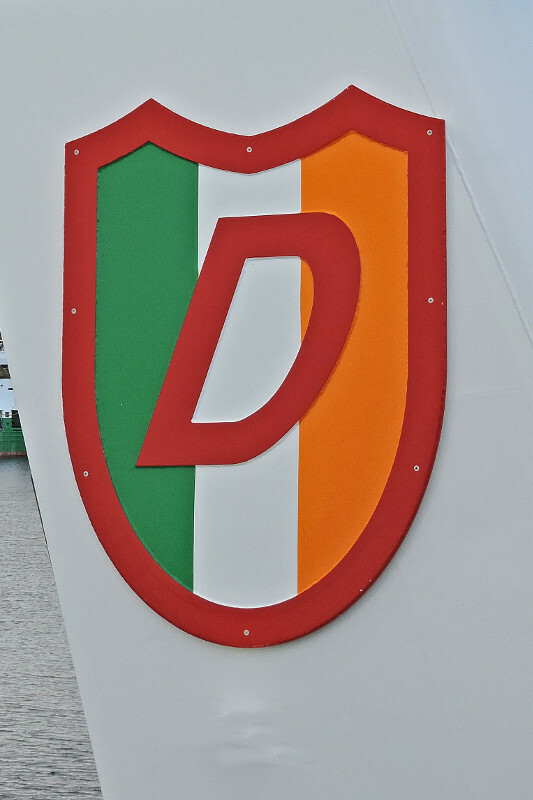 The main sleeping accommodation, comprising two single and three twin-berth en suite cabins, is arranged at main deck level, extending from port of the vessel’s centreline to the starboard side, and located as far forward of the propeller as possible to ensure minimum noise levels. 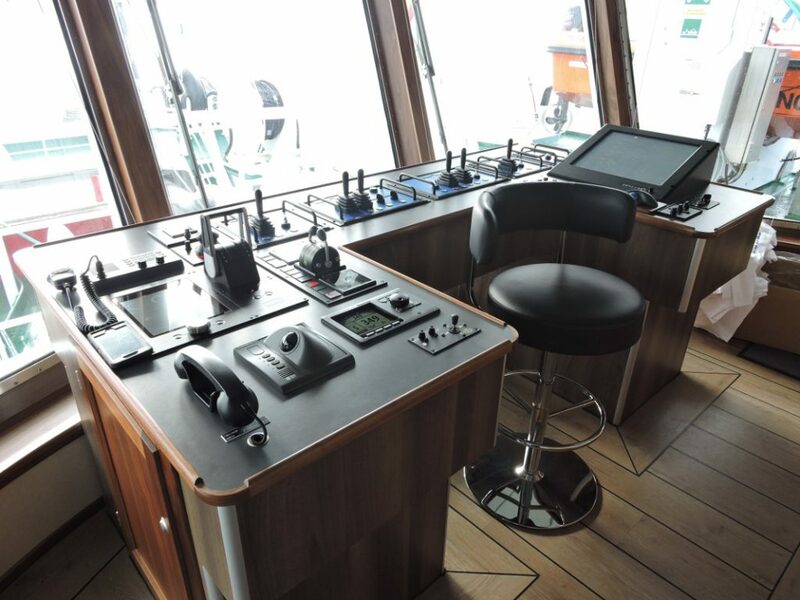 The crew changing room and engine control office occupy the remainder of the space on the portside of this deck. The hydraulic pump room is located aft on its starboard side, opposite a large engineering workshop/store to port. Western Chieftain’s spacious and well laid-out engineroom houses a MaK main engine and twin Caterpillar auxiliaries. 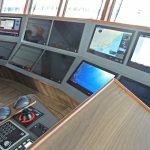 Together with the rest of the machinery, these are constantly monitored from the customary soundproofed control room, situated one deck higher on the port side. 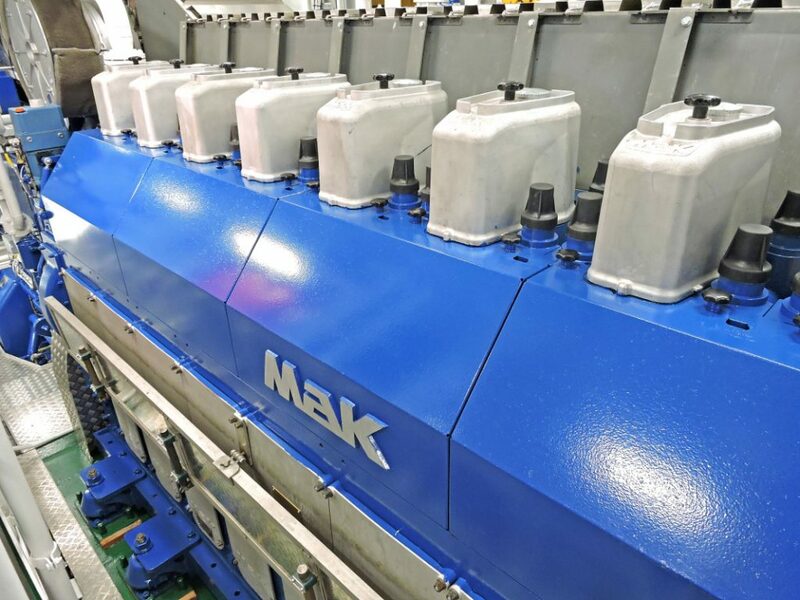 Developing 2,400kW @ 750rpm, the MaK 8M25C propulsion unit turns a CAT MMP 850 3,600mm-diameter four-bladed CP propeller system, housed in a matching nozzle, through a RENK RSVL 750 5.56:1 reduction gearbox. Giving a maximum propeller speed of 135rpm, this centreline package enabled Western Chieftain to return an average top speed of 14.5 knots on engine trials off Skagen, when sailing in ballast condition. 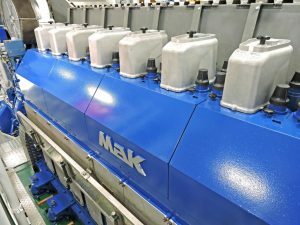 A gearbox PTO is used to drive an AvK DSU 440V three-phase shaft alternator, producing 1,875kVA. Further electrical power is provided by 560kWe Stamford generators, driven by Caterpillar C18 auxiliary engines. A 129kW Caterpillar C9 harbour genset is located in the forecastle. 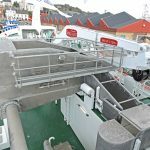 When shooting or hauling the midwater trawls, the gearbox PTO will be clutched in, enabling the shaft generator to supply electrical power to the deck machinery via the hydraulic packs. 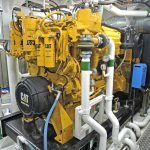 This operational characteristic reflects the fact that, during requirement for full power on the deck machinery, there will not normally be a similar demand for power on the main engine. 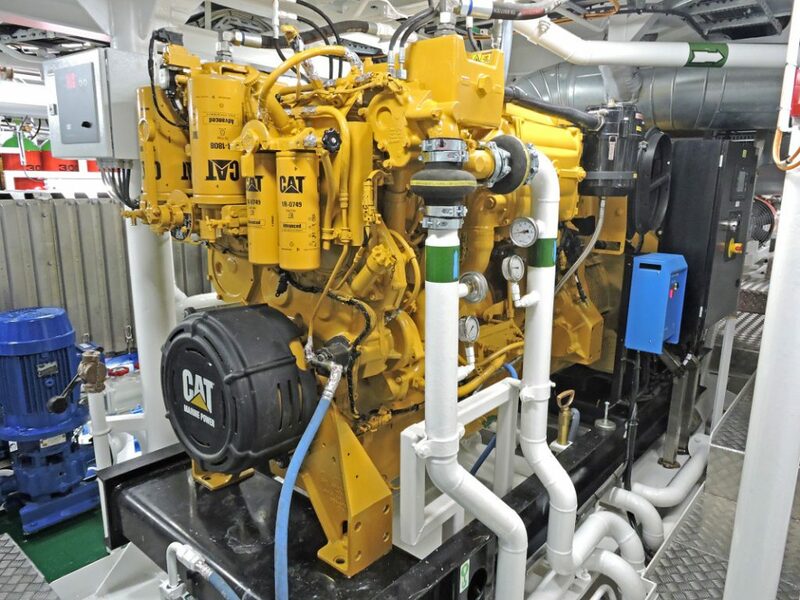 During normal towing, when more engine power will be required, the shaft alternator can be disengaged, and electrical power will be supplied by one of the Caterpillar gensets. 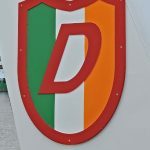 These can be connected into the main switchboard, controlled by Western Chieftain’s fully-integrated DEIF power management system. 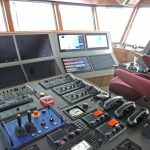 Western Chieftain also features a frequency converter for floating frequencies between 50Hz and 60Hz, designed to operate with optimum levels of efficiency and economy across all modes of vessel operation. … and one of two Caterpillar C18 auxiliary engines. Two Brunvoll tunnel thrusters, in which skewed bladed propellers give optimal thrust bow (559kW) and stern (1,375kW) with low noise, assist vessel handling in confined areas and when keeping station to fishing gear. 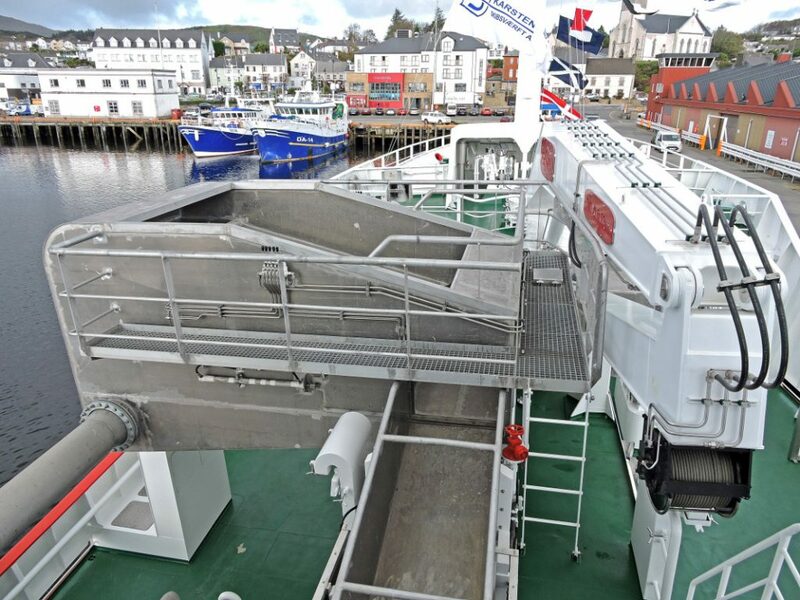 A combination of Rolls-Royce Tenfjord steering gear and a Rolls-Royce lift flap rudder are fitted to optimise Western Chieftain’s manoeuvrability under all operating conditions. 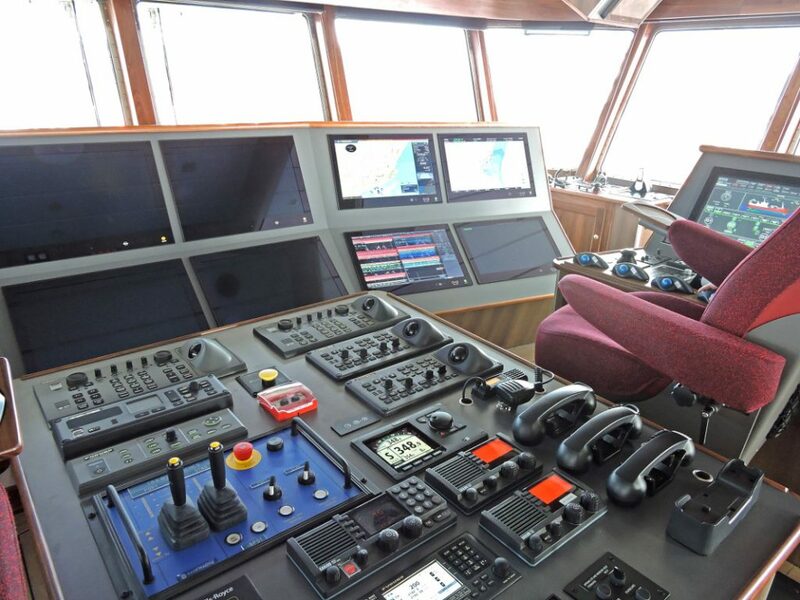 In keeping with the now well-established trend on pelagic vessels to install two separate ship management systems, all remaining systems onboard Western Chieftain – ie main alarms, engine controls, bunker tank sounding, navigation light controls, deck light control, etc – are monitored and operated through a separate system from supplier Marine Control Services. A combination of double bottom and deep fuel tanks allow 155,000 litres of fuel to be carried. Western Chieftain’s freshwater capacity is 13,000 litres. 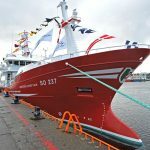 The bulbous bow can carry 38t of seawater ballast, enabling the vessel’s handling characteristics to be fine-tuned to the prevailing conditions. 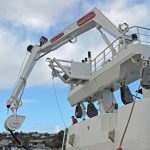 Norwegian hydraulic specialist Rapp Marine AS supplied the full package of trawl equipment and cranes installed on Western Chieftain. 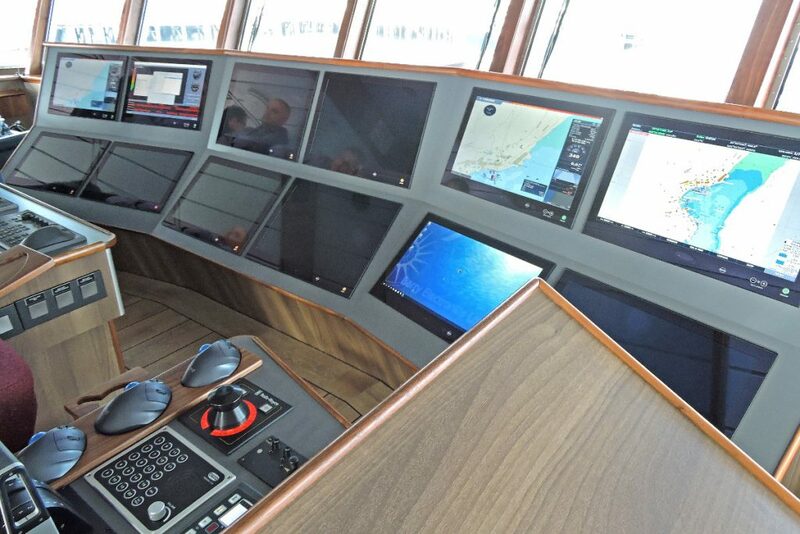 The main gear-handling area on the full-length shelterdeck is protected by a wraparound boat deck that encircles the stern. 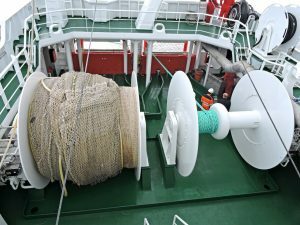 This arrangement ensures that the crew have clear and immediate access to the midwater trawl gear from two levels when clipping on/off helper pennants/backstrops etc from the trawl doors. 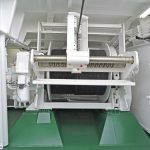 Positioned abaft the wheelhouse casing to port and starboard on the shelterdeck, the 61t core-pull split trawl winches are operated through a Rapp PTS-Pentagon Cbus – EF autotrawl system. 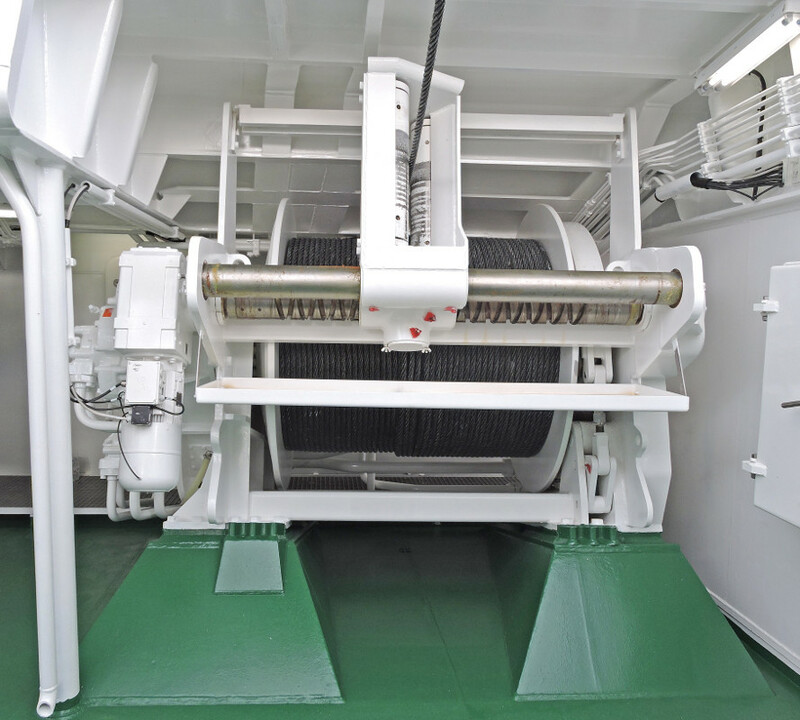 Spooled with 1,200m lengths of 32mm-diameter trawl wire, the winches give straight and parallel leads to the inboard Blue Line hanging blocks suspended within the underside of the stern gantry, to which companionways give ready access. 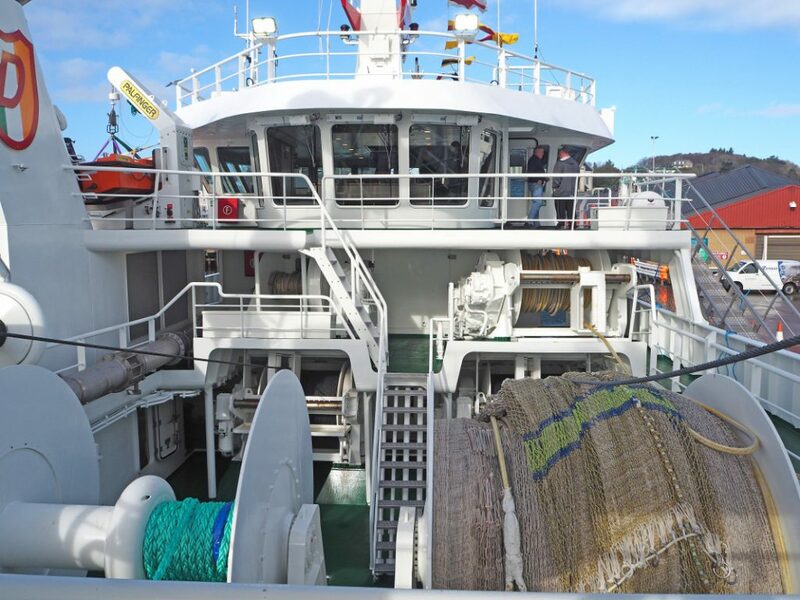 Midwater trawling is just one of the functions performed by the Rapp PTS-Pentagon Cbus –EF autotrawl system. 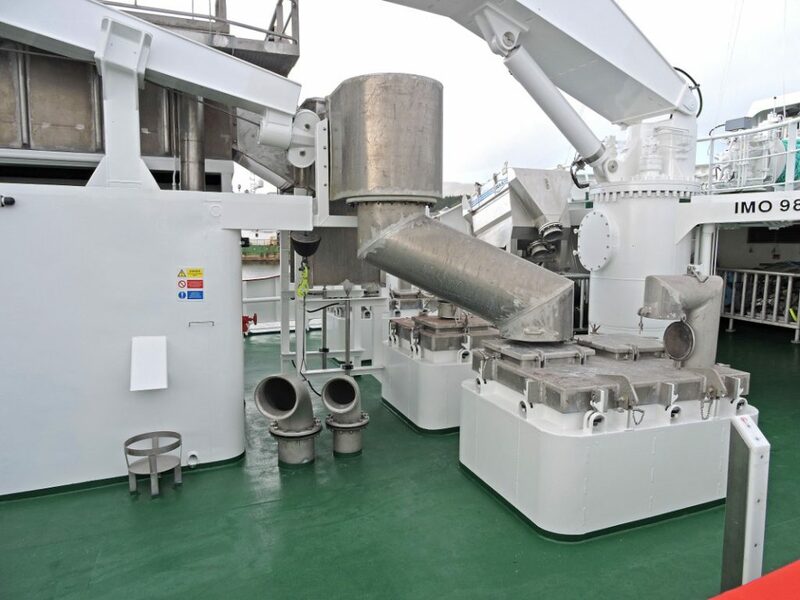 It also delivers a full hydraulic management programme, controlling the array of electro/hydraulic aggregate power packs housed in the large pump room aft on the starboard side of the main deck, in close proximity to where all of the trawl machinery is located on the decks above. 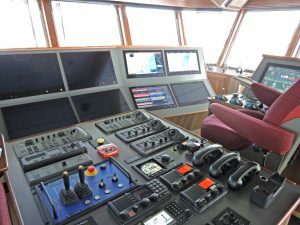 Selected operating modes, matched to working practices now established on Western Chieftain, are programmed into the Rapp PTS-Pentagon Cbus – EF autotrawl system. 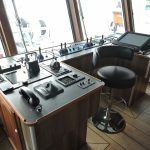 This ensures that the optimum combinations of hydraulic pumps are always available, allowing the operator to concentrate fully on activities on deck – of which the commanding trawl console, located to port in the wheelhouse, provides an excellent view. … and served by a dedicated hydraulically operated lifting arm. 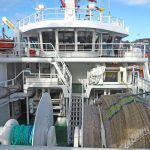 The well-known Killybegs companies Swan Net-Gundry and KT Nets supplied Western Chieftain’s mackerel/scad midwater trawls. Rigged with 38-fathom braillers, these are worked from two 61.5t net drums, arranged either side of the vessel’s centreline at shelterdeck level. 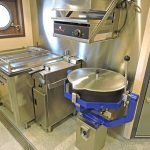 Each drum is served by the customary toe-end weight tracks, leading towards two hydraulically operated stern doors, fitted with rollers along their top edges. A 60t lifeline winch for handling the bag is mounted directly above the trawl winches on the boat deck. 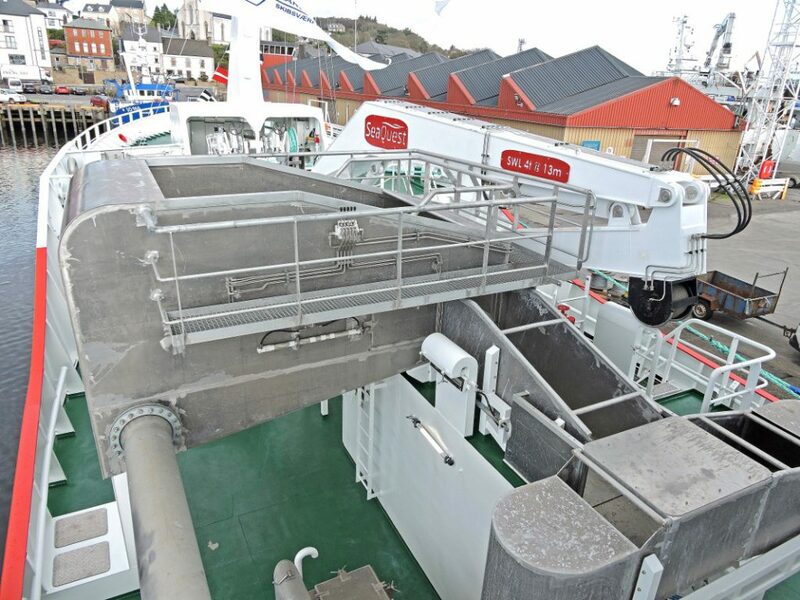 Reflecting the fact that Western Chieftain is rigged for pumping pelagic fish at the stern, a 37t tail-end winch is also located at this level towards the portside, for use when heaving the codend to the stern, before the sock is taken up and attached to the fish pump. The towing blocks, together with topline and tail-end blocks, are mounted on the underside of the trawl gantry, which is an integral part of the vessel’s stern construction. 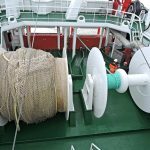 In addition to the net sounder cable winch, Rapp Marine also supplied a selection of anchor, mooring and auxiliary winches, positioned at strategic locations throughout the vessel. 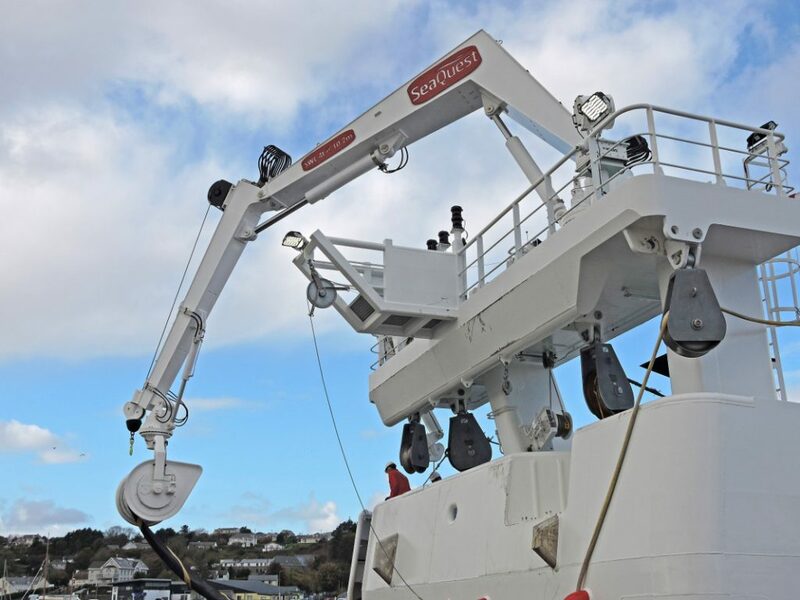 One of two knuckle boom deck cranes custom-built by SeaQuest Systems in Killybegs is mounted towards the starboard side of the trawl gantry. 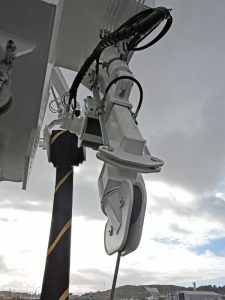 The aft crane has a lifting capacity of 4t @ 10.2m, and is fitted with a SeaQuest type PB02 powerblock, featuring hydraulic tilt and continual rotation. The continual rotation facility on the powerblock is an extremely useful feature for mending midwater trawls, or taking twists out of the net, brailler or bridles. The forward knuckle-boom crane has a reach of 12m, and is fitted with a 4t winch. 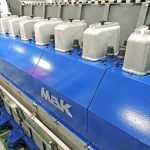 As is standard for SeaQuest cranes, all hinge pins, cylinder rods, hydraulic fittings and pipework are manufactured in stainless steel, while all other parts were shotblasted and metalised before painting. In order to ensure continual operation throughout a trip, the two deck cranes and fish pumping machinery were supplied with the same style of interchangeable radio-control unit. 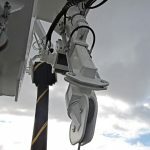 In the unlikely event of one control unit being dropped in heavy weather, this will allow the operator to ‘borrow’ another crane’s transmitter, by swapping out a SIM card-style chip mounted in the unit. 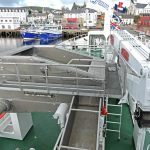 SeaQuest Systems also supplied the 16in fish pump, and full package of associated deck machinery, used by Western Chieftain’s crew when taking pelagic fish onboard at the stern. One of Western Chieftain’s two York/Sabroe refrigeration plants. 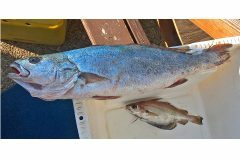 At the end of a successful tow, trawled catches of blue whiting, mackerel or scad are taken aboard aft on the portside, before the fish are pumped forward to the dewatering system mounted atop the shelterdeck amidships. While using the net drum to dry up the brailler, the 38t tail-end winch, mounted to port on the boat deck, is used to haul the bag back to the quarter, before the sock is attached to the pump located on the raised aft section of the boat deck, just forward of the trawl gantry. 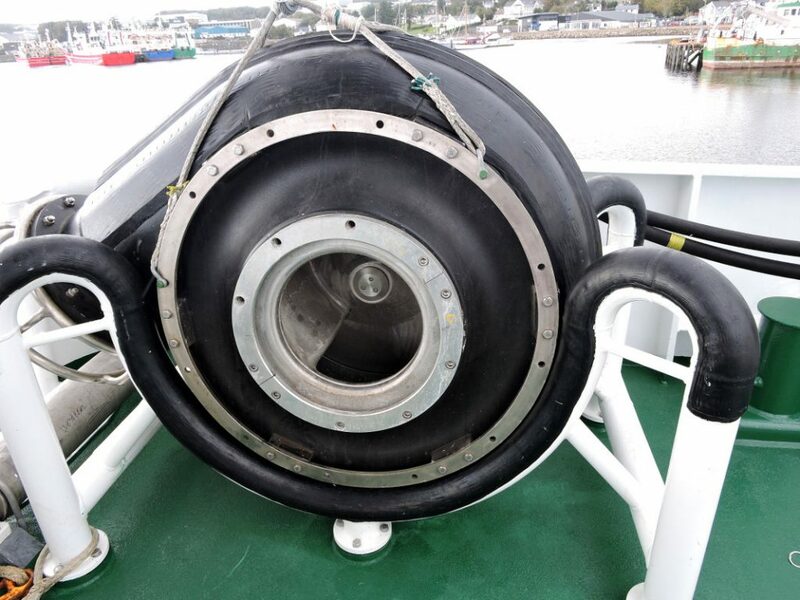 The storage reel for the hydraulic pipes is positioned forward of where the fish pump is secured on the portside boat deck, directly above the fish hose reel on the shelterdeck. 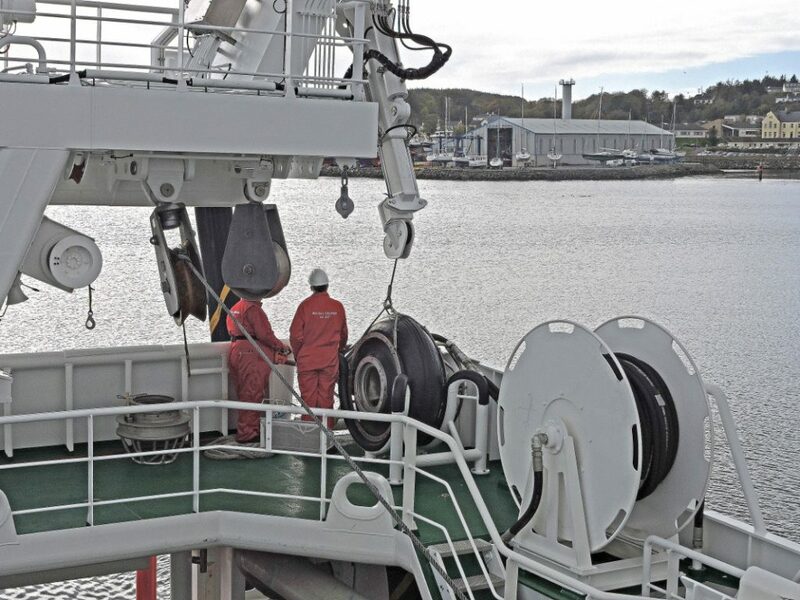 After the 16in SeaQuest pump is lowered into the water by the gantry crane, and the bag is slackened off, 80m of 450mm-diameter fish hose (10mm thick) and 80m of hydraulic hoses is run off the reels. 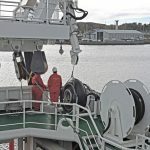 After clipping a short length of flexible rubber hose that connects the fish hose to the main delivery pipe, pumping operations commence at a rate of some 400t an hour. 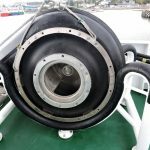 A large-diameter stainless steel delivery pipe extends from the quarter, some 30m forward on the portside, to the fish/seawater separator system amidships. Western Chieftain landing her first shot of mackerel at Killybegs, ahead of Girl Stephanie. 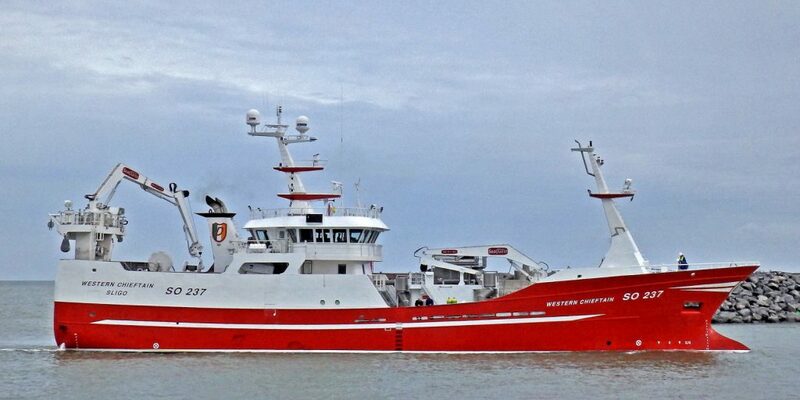 Karstensens liaised closely with Premier Trawlers, placing a strong emphasis on the requirement to land a top-quality product into what is a highly competitive international marketplace. 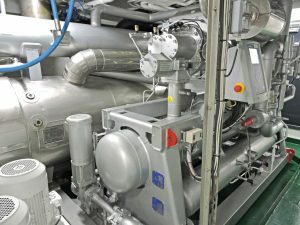 Mounted on top of the pumping room at forecastle deck level, the seawater separation system, designed and manufactured in-house by Karstensens Shipyard, delivers pelagic fish into the selected combination of stainless steel chutes for delivery down into one of Western Chieftain’s eight RSW tanks, which have an internal volume of 851m³. The forward and aft tiers consist of three tanks, with two amidships either side of a central pump room. While this arrangement is primarily designed to ensure that the vessel settles on a level trim when returning to harbour after a successful trip, thereby increasing freeboard, safety and fuel efficiency, this central location also brings the added benefit of ensuring shorter and more equal pipe runs, and fewer internal pipes routed through the tanks. A central corridor runs between the insulated tanks at main deck level, to give quick access fore and aft. 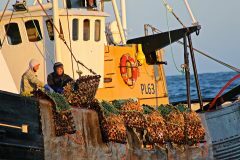 A fully interconnected pumping system ensures maximum catch quality. 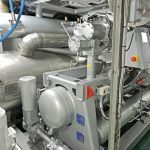 This permits circulation for each tank to be managed individually, using the output of two Johnson Controls (York/Sabroe) RSW ammonia-operated chilling systems. 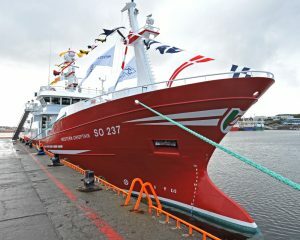 These can operate separately, delivering 375,000kCal/h each, or can be used as one common system, enabling pelagic catches to be brought down to the desired storage temperature of -2°C in often less than two hours, depending on the quantity of fish pumped aboard, and the number of RSW tanks brought into use. The RSW system includes 2 x 450m³/hr circulation pumps and 2 x 190m³/hr condenser pumps. All controls for the pneumatic cylinders used to direct the flow of fish from the separator unit are housed in the RSW control room, the port side of which contains a dedicated wet room. 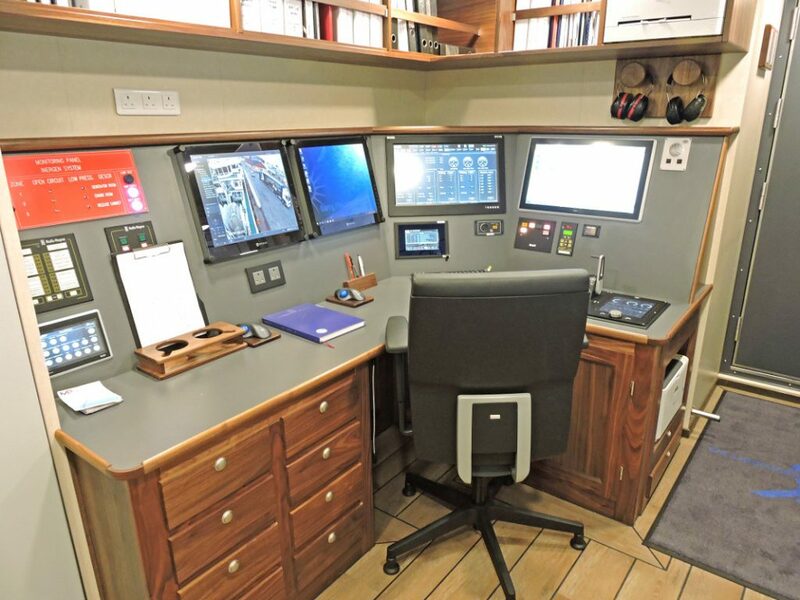 Here, selections of pelagic fish are sampled using a set of Marel M 2200 electronic scales, from which all information is automatically transferred to skipper Charlie Doherty in the wheelhouse. 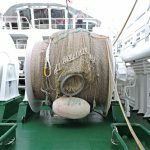 Pelagic catches are discharged ashore by an IRAS vacuum-pumping system that incorporates two 2,800-litre tanks and three 55kW compressors. 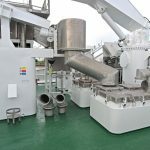 The vacuum pumps and compressors are positioned at main deck level between the forward tier of RSW tanks, forward of the similarly arranged RSW machinery situated between the middle and aft tier of tanks. The central RSW pump room is located one deck lower.